In partnership with Medscape, CDC has released a new video titled Ebola: Donning and Doffing of Personal Protective Equipment (PPE) that offers step-by-step demonstration on how to put on and take off PPE properly in order to protect those providing care for patients with suspected or confirmed Ebola virus disease. 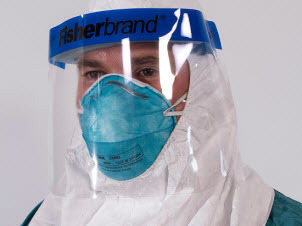 This video is based on CDC Guidance on Personal Protective Equipment To Be Used by Healthcare Workers During Management of Patients with Ebola Virus Disease in U.S. Hospitals, Including Procedures for Putting On (Donning) and Removing (Doffing), as of October 20, 2014. It can be found at http://www.medscape.com/viewarticle/833907 and features CDC’s Dr. Arjun Srinivasan and Dr. Bryan Christensen.